Is your Boyfriend Birthday coming? Is that, so you have an excellent opportunity to express your loving feelings for your Boyfriend. 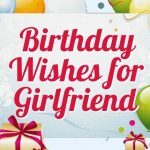 Today we are presenting our heartfelt collection of Happy Birthday Wishes For Boyfriend. It can help you to show your debate for your boyfriend. You can easily impress your boyfriend with these wishes. These words have an ability to attract someone who is close to you. 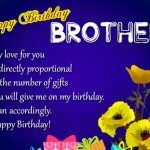 You should try our vast collection of Happy Birthday Wishes For Boyfriend. Every boyfriend expects to his girlfriend that she will wish him with a different and loving word. Surprising your boyfriend as he wants. Hope you enjoy it. 1 ) Being with you makes all the knots of life come undone. Happy birthday. 2 ) On your birthday, I thought about putting just one candle on your cake to portray that you are truly one of a kind for me. 3 ) You have given me a lot of lovely and Irreplaceable memories in my life. 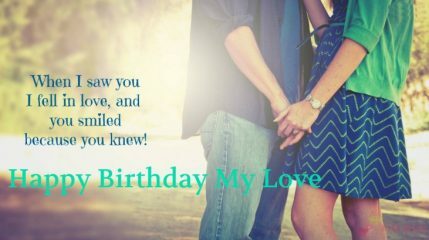 So, I am sending you tons of Birthday wishes my boyfriend. Happy Birthday to the boy I have fallen for, Stay Blessed! 4 ) When I hold an adorable puppy, it reminds me of when I hold you. You give me that warm fuzzy feeling. Happy Birthday! 5 ) When there is a fire, most call the fire department, but I call you instead, even though you are the one who started the spark! Now put out those candles on your birthday cake! 6 ) From the moment I saw you, I was intrigued by your smile and handsome charm. Now it is your special day, and I want you to know I am still head-over-heels. 8 ) There’s nothing in this world better than cozying up with my man on a cold night- except when it’s his birthday! Happy Birthday my warm, snuggly man! 9 ) For the most handsome boyfriend in the universe, I hope your birthday is all you could ever want. With love and devotion, always, your very happy girlfriend. 10 ) When I looked up at the sky that night, I made a wish when I saw a falling star. My wish finally came true, which is why I am here with you. With all of my love, Happy Birthday! 11 ) Happy birthday to the guy who’s has always been my heartthrob and heartbeat, never my heartbreak or heartache. 12 ) You are the person who always hold my hand gently, who listen to my voice day and night, and make everything right that goes around me. Happy Birthday to that boyfriend. 13 ) Wishing you a wonderful Happy Birthday! You are not just my boyfriend, but my best friend, too! 14 ) I made a wish one night to find the most perfect, most handsome man in the universe. My wish came true, and I hope all your wishes come true on your special day. Happy Birthday! 15 ) Your smile, love, and laugh make me live my life more happily. Thanks for all the support you gave me in my life. Happy Birthday to my superhero. 16 ) Happy birthday to the boyfriend that most girls can only dream of having. I love you. 17 ) Happy birthday to the guy whose smiles and laughter I live by. Thanks for making my life tick. 19 ) It’s always a treat to wish Happy Birthday to someone as sweet as you. 20 ) Being in a relationship with you is crazier than the craziest roller coaster ride. I love my life, all thanks to a wonderful boyfriend like you. Happy birthday. 21 ) Even when my skies are grey, you brighten every day. You will always be the love and light in my life. Happy Birthday! 22 ) There is nothing cozier than cuddling up to a nice warm fire on a cold snowy day. Well… unless it’s cuddling up to you on your birthday, my love. 23 ) I am sending you tons of love on your Birthday, May this Birthday is as cool and awesome as you are!! Happy Birthday, Darling! 24 ) I am the luckiest girl in the world to have a boyfriend like you. Same pinch, because you are the luckiest boyfriend in the world to have a girlfriend like me. Happy birthday. 25 ) Happy Birthday to the man who makes me feel beautiful and loved, the one who listens to me and holds my hand every step of the way. This day is for you, my love. 26 ) My love grows stronger for you as each year passes by, so on your birthday, let’s take the time to make your birthday a happy one! 27 ) To the handsomest birthday boy, you have a quiet strength that makes my heart sing. I love you and cherish our time together. 28 ) I’m so excited to be with you for your birthday this year. Here’s to making sure the upcoming year is filled with fun, love, and romance together. I can’t wait for all of the wonderful times the next year will bring us. 29 ) I never thought I could love anything more than I love ice cream- until I met you. Let’s go out for some ice cream on your special day! Happy Birthday! 30 ) I never thought I’d love anything more than ice cream, until I found you, of course. Wishing you the best birthday ever, my sweetheart. 31 ) My love for you grows with each passing birthday, so let’s make this an extra special day where our love gets even stronger. Happy Birthday my love! 32 ) All the boys in the world should learn from you, how a Boyfriend should be. You are the best Boyfriend. I Love You. Happy Birthday, Sweetheart!! 33 ) Guys should learn from you, what being a boyfriend is really all about. Happy birthday. 34 ) Happy Birthday to my boyfriend who holds my hand firm but gentle, who listens to me day and night, and lets me know everything is going to be all right. 35 ) I started dating you because I thought that you were a good looking catch. Now my thoughts have changed, and I think that we are the perfect match. Happy birthday handsome. 36 ) Happy Birthday to the man who has always been there for me. Whether rain or shine, I’m so happy and grateful that I can call you mine. 37 ) For your birthday, I got the balloons, the cake, and the streamers. But I also bought you something that didn’t cost me a thing: my love! Happy Birthday! 38 ) For the guy who can charm me from across the room with just a smile, I hope this day brings everything you want and more! 39 ) I’d like to wish a lovely and very Happy Birthday to the prince in my life. 40 ) For your birthday, I want to give you cuddles and soft kisses under the stars, but most of all I want you to know how happy I am to be your girl. 41 ) This greeting is for my knight in shining armor. You protect me, you love me. I am your princess, here to wish you a happy, and beloved, birthday.